The PBR (Patrol Boat, Riverine) is a small rigid-hulled patrol boat used in the Vietnam war. The small versatile vessel could operate in shallow and weed-choked rivers with great speed and maneuverability. PBR Streetgang is the name given to the boat crew in the 1979 Vietnam film Apocalypse Now. “The crew were mostly kids. Rock and Rollers with one foot in their grave” tells Martin Sheen, in what could be described as a film that not only illuminated the Vietnam tale, but also the underlying insanity of the times. The pair earned great respect across the musical spectrum with fans such as Crazy P, Greg Wilson, The Unabombers, Clive Henry and Ralph Lawson. Their unique musical approach, never failing to connect with the crowd, threading Larry’s New York legacy to the Jacking underground beats of their Leeds roots. PBR Streetgang have released productions on labels such as 2020 Vision, Red Music, Futureboogie, E.A.R, ISM and Wolf Music. 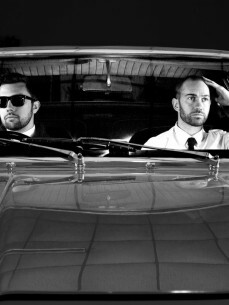 They are very excited by a forthcoming release on Jamie Jones Hot Creations in late 2011.